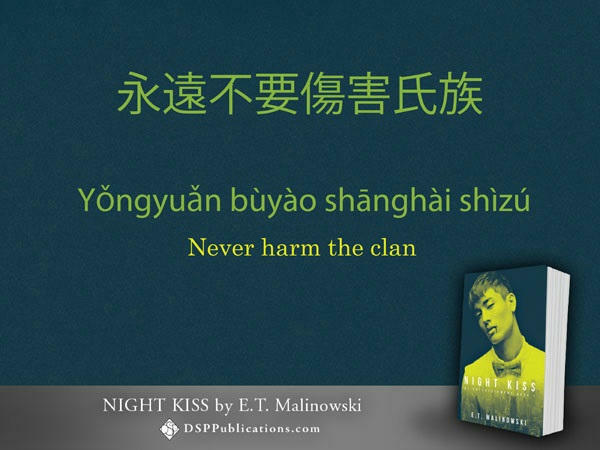 Night Kiss by E.T. 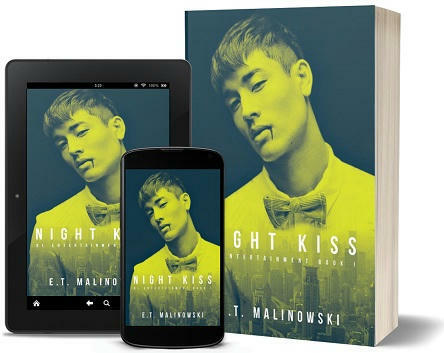 Malinowski Blog Tour, Exclusive Excerpt & Giveaway! .•.•. **❣️ DSPP | Amazon US | Amazon UK | B&N | iBooks | Kobo | Google+ ❣️**.•.•. Ki-tae arrived at his sire’s home in one of the more affluent districts of Seoul. Beyond the walls, it was as if he’d stepped from the city to the country. In the spring, summer, and fall there was greenery everywhere. Zelkovas, alders and birch trees, though they were bare of leaves at present, abelia shrubs and camellias in various shades creating a transitional rainbow affect when they were in bloom. Snow blanketed the entire area at the moment, but the soft burble of water could be heard in the quiet of the night. He truly did enjoy coming to his sire’s house. It made him feel… safe, secure, and that was a feeling he cherished. There was a time when he wasn’t either of those things, and Ki-tae never wanted to go there again. A chill danced up his spine, and he immediately shook it off. He turned off the main walkway and followed the stone path curving around the right side of the house. It took him through a small garden and over a little wooden bridge spanning a decent-sized koi pond. A sheet of ice covered the surface, but the pond had been installed with a heated edge used only during the winter which kept the pond from completely freezing and allowed for ventilation with the use of the aerator. The path continued between two peach trees standing to either side, as if they were sentries guarding the emperor’s castle. Ki-tae chuckled. He paused long enough to remove his shoes and place them on the tidy wooden shelves nearby, noting three other pairs already settled. Then he walked through the open doors and into a spacious sunroom. He continued through, weaving around the low table and cushions into the dining room. The room was a long rectangle, its walls showing serene landscapes of Korea, China, and Japan, all places they had lived at one point or another. Beyond that was the kitchen, an ode to their love of food with sleek appliances and maximized counter space. They would make breakfast together in the morning, able to move around the kitchen easily and freely. This weekend visit was always their time to be a family, something all of them had lacked for a long time. Ki-tae pushed his fingers through his hair as he walked into the small nook to the right of the kitchen. It was a cozy room filled with warm, welcoming color. He found Cheongul, HanYin, and their sire all seated at the medium-sized square teak table, waiting for him. “Stubborn old goat,” Ki-tae teased affectionately. Ki-tae took his seat to Soon-joon’s right. In the privacy of their home, certain protocols were not observed unless company was present, though there was very rarely any company present. Sometimes, it still struck Ki-tae as odd to eat regular food. He remembered asking once, as many of the stories he’d heard said they only existed on blood. His question resulted in a lengthy—very lengthy—explanation of how blood maintained their qi and thus their enhanced senses, reflexes, and healing ability while regular food maintained their physical body. Why Soon-joon couldn’t have just told him the food was for the body and the blood for the qi and leave it at that, Ki-tae didn’t know. His father seemed to like lengthy explanations. Once Soon-joon picked up his spoon, they dug in, chattering about nothing in particular as they served themselves and each other. Soon-joon invariably placed more food in their bowls, exclaiming they didn’t eat nearly enough when they tried to protest. “Quit complaining. You’re all too skinny as it is,” Soon-joon said, turning back to his own food. “Not me. This is all healthy!” HanYin said with a smile, yanking up his shirt to show off his muscles. As soon as they were all settled with their food and had taken several moments to eat, Ki-tae felt Soon-joon’s eyes on him. He looked up into his sire’s gaze. It was intense but beyond that, unreadable. “People love good stories and good music,” HanYin agreed. Ki-tae glanced away for a moment. He had been hesitant to present the idea, thinking they wouldn’t like it, would think it too gimmicky, but he was tired of all the videos just being them singing and dancing. He had nothing against those types of music videos, but he wanted their fans to have more. “It was just a thought,” Ki-tae mumbled, staring down at his food. “I thought that was what your scholarship program was for?” HanYin said as he examined a piece of pork before putting it in his mouth. At his father’s place, he used his manners… for the most part. “How does that relate to my suggestion?” Ki-tae asked. “You said that was the first part. What’s the second?” Cheongul said, pushing his bangs out of his face. “In part two, each student will write an original song. They will compose it, record it, and produce it,” Soon-joon said. “What’s the catch?” Ki-tae looked at his sire. “The song will need to take into account the vocal style of not only Bam Kiseu as a group, but each of your individual vocal styles.” Soon-joon smiled almost beatifically. “And this is going to be a yearly thing?” Cheongul asked. “You’re just an old softie,” Ki-tae teased as Cheongul nodded. “What made you do this?” Ki-tae asked, suddenly seeing a bit of regret in Soon-joon’s eyes. When those eyes met his, he could see pain as well. “What was that?” Cheongul asked hesitantly, glancing at Ki-tae. “Can you tell me why you fed so deeply from him that he smells of you, even after bathing?” Soon-joon said. There was no heat in his voice. 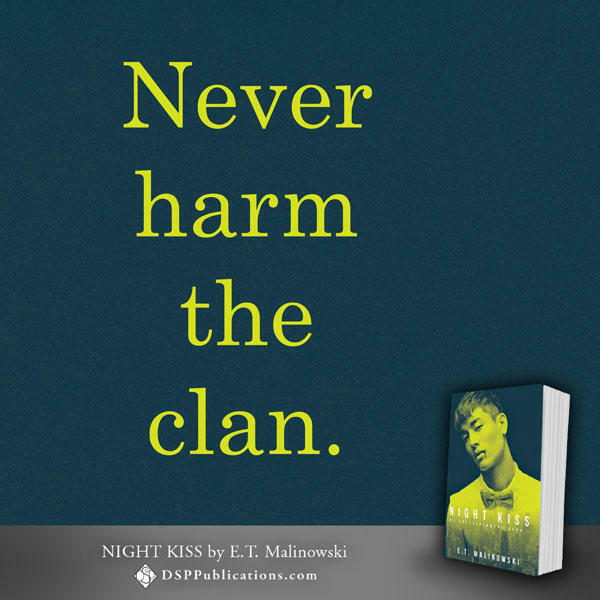 “I… yes,” Ki-tae said softly, hanging his head. At the time he hadn’t been ashamed at all. Now he felt very guilty. “What do you mean, bind me to him?” Ki-tae asked, snapping his head up to stare at Soon-joon. He… he couldn’t go through that again, couldn’t belong to someone, controlled by them, not ever again. He started shaking in his seat, his grip on the table causing it to vibrate. The roaring in his ears made their voices fade away. He dug his claws into the wood, leaving deep furrows. 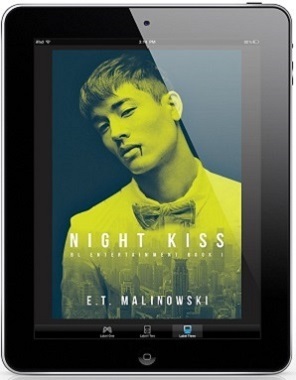 His fangs descended, puncturing his lips as they hadn’t done since he was first turned. Hands grabbed him, and Ki-tae struck out with a roar. Vague sounds of crashing and shouting followed. He tried to get away, tried to break free, and then he heard that voice in his ear, the sound of love and safety and peace. Ki-tae curled against Soon-joon as they fell to the floor, his face pressed into his father’s chest. Tears streamed down his face; he curled his fingers tightly in the fabric of Soon-joon’s shirt. He couldn’t think, couldn’t breathe. It all hurt so much. What was he going to do? He could never go through that again. It would kill him this time, Vampire or not. Gentle fingers stroked his hair, soothing him into sleep. Win a $10 DSPP GC! 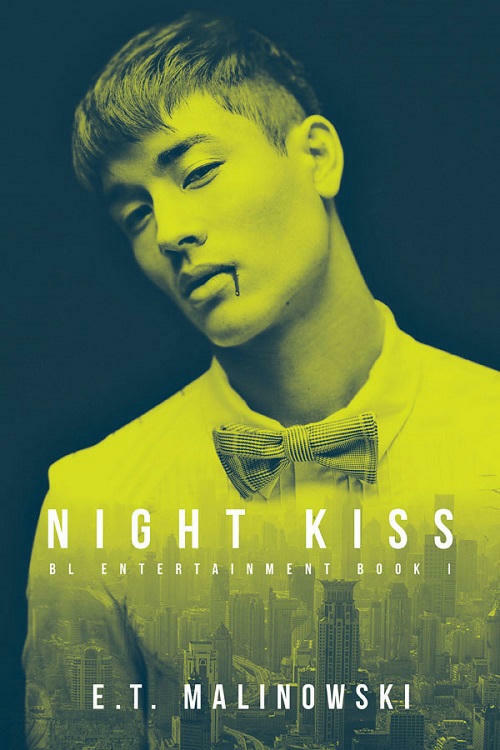 Posted on January 11, 2019 by pixiemmgoodbookreviewsPosted in Author Giveaway, Blog Tour, DSP Publications, ExcerptTagged BL Entertainment series, DSP Publications, E.T. Malinowski, Gay Paranormal, GLBT Paranormal. Previous Previous post: Out in the Offense by Lane Hayes Release Blast, Excerpt & Giveaway! Next Next post: Stalker\s by L.J. Hasbrouck Release Blast, Excerpt & Giveaway! Thank you MM Good Book Reviews!